Gage marketing was one of my first design jobs after college (it was 2007). Gage is a digital agency located in Minneapolis, MN. At Gage, I was lucky to work under Mike Kraabel. He was is still one of the best bosses I've ever had. Mike introduced me to the world of advertising agencies and bulk developing production art. We brainstormed in meetings and practiced forward thinking in a creative way on a daily basis. I wish I had a picture of my office at Gage, because even that was cool (side tangent). One wall had a corkboard. The hallway wall was all glass and frequently used as a whiteboard. The back wall was a giant window facing a garden. Gage has a lot of big clients, that I'm sure you can find on their website www.Gage.com. My favorite project was working on Lawry's seasoning salt. I bulk edited the production art (rounding corners, optimizing images, inserting text etc.) 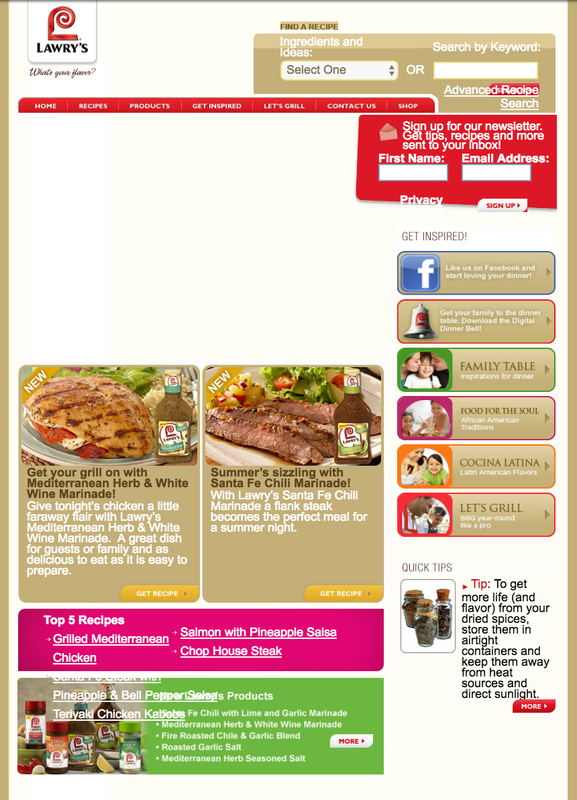 and helped develop some of the email newsletter templates. It was fun work and I still love seeing the (new then) product designs on the shelf. I worked on a few other notable projects for companies like 3M and Best Buy. The projects had very exact (to the pixel) design standards and branding guidelines. Those projects where fun and interesting. They sparked an interest in technical writing and furthered my passion for organization. In fact, almost every project I work on has it's own print and digital folder with style guides, a pattern library, a vision document, and copies of various business requirements. PMP training in 2015 gave me even more ideas on how to stay organized when working on multi-million dollar sometimes international projects. Note: The image pictured is from the client's 2016 website not from the period of work.